With a new record complete but no label to put it out, Morrissey debuted three new songs — “Action Is My Middle Name,” “The Kid’s A Looker” and “People Are The Same Everywhere” — in a live session recorded last week and broadcast tonight on Janice Long’s late-night show on BBC Radio 2. As can be expected, recordings of the three rather rocking new songs by the ex-Smiths frontman — who opens his summer European tour tomorrow night in Scotland — are all over the web, and we’ve got all three posted below for your streaming pleasure. In a statement released last month, Morrissey revealed that he’s got a new record in the can: “The follow-up to Years of Refusal is ready and fluttering wildly against the bars. There is still no record label and the years shuffle like cards. My talents do not lie in DIY.” The three songs premiered tonight presumably are part of that album; it remains to be seen whether Moz will debut more on his upcoming tour. 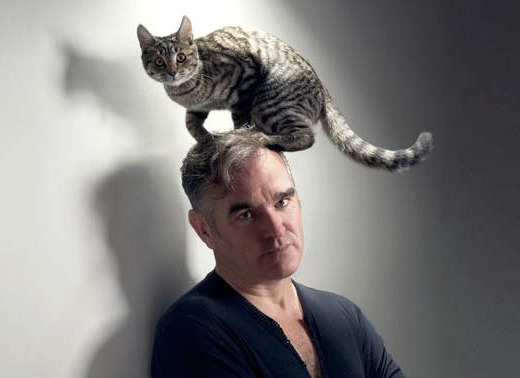 I love Moz but these new songs are very ordinary. So… Bsides fare at best, although “people are the same” grows on you as a listen (NOT a single, please?). Darn, I already didn’t care for his last album. its incredible how his voice NEVER changes one bit. There was no Viva Hate tour, Justine.